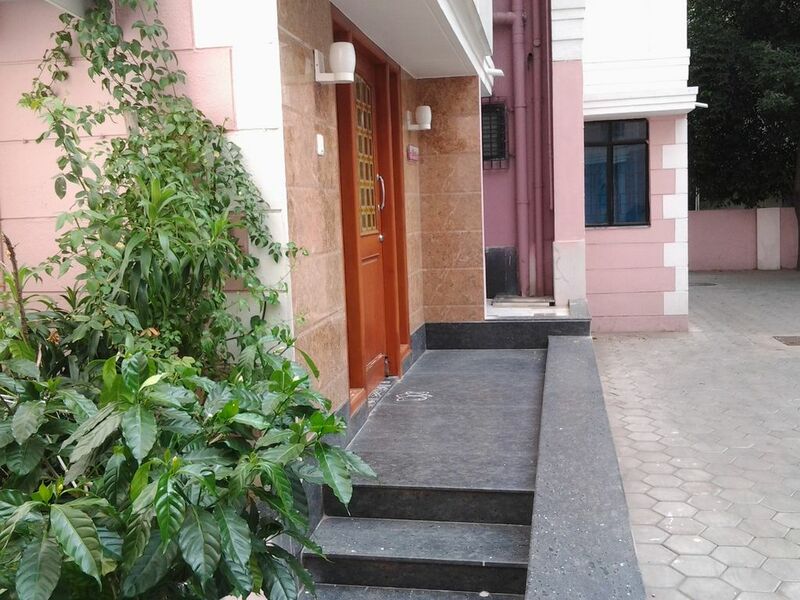 2 Bed-room apartment, fully air-conditioned, fully furnished, 2 bathrooms, with kitchen, gas stove, refrigerator, Dish TV with more than 300 channels, 24 hour human and CC Cam security, in a peaceful location, situated in a commercial location. Smoke free and pet free home.Owners have 3 identical homes in the same property, which is among 32 homes. No worries about privacy. Owner staying in the same property. I am in the business of home building for nearly 30 years! Have built more than 13000 homes all in Chennai and known for my un-compromised buildings. I am in the business for a long haul and hence you can be assured you wont be disappointed with my home! I am a co-founder of "Alacrity", and the first Managing Director of Alacrity Housing Limited, the Company which was the leader of residential homes in this part of the world. Several articles are produced on our business model. The property is situated equidistance from every business activity in the city. Considered to be a landmark real-estate. The offices of Alacrity used to function from one of the building once. The property is just renovated and the two apartments of ours is just recently refurbished. Bathrooms are fitted with European Water Closets, hot and cold water showers (serviced through electric heaters fitted in each bathrooms, with health facets etc. The property is in the central district, which is the heart of the city. The property is nearly 2/3 of an acre with 1/3 of an acre vacant space. T. Nagar is the shopping district of shopping. Living room, bedrooms are air-conditioned with split airconditioners. Guests are requested to switch the AC off when not required. Bed sheets, pillows, are available. LG washing machine available on request, for no payment. Clothes lines are available in the apartment. Open car parks are available in the property. Unlimited internet available in the living room and some other part of the rooms. Towels are available. They are washed an sun dried, generally. Sofas, centre table, satellite dish with television and more than 300 channels (service provider, Airtel, leader in the industry). Entire living room is lighted with LED lighting. Microwave available on request, subject to availability. Available on request, subject to availability. Available on request, subject to availability, on extra payment. There is a provision shop available on the 3 building. We have a beautiful kitchen. Dining table for 4 persons available. You would be living in a very safe property. We are on physical as well as webcam surveillance 24x7. Chennai is a power surplus place but an occasional power outage, for short duration could be experienced. The property is close to many shopping centres, malls and star hotels.